Whether you love your job or hate your job, getting burned out is an all too easy phenomenon that affects employees every day. Maybe you’re someone who constantly says “yes” to whatever is asked of you because you truly love your work, or maybe you go the extra mile because you know that’s what leads to a job promotion. Maybe you don’t feel that you have a choice. It could be that your employer works you overtime or the sheer dynamics of your workplace just serve to cause you daily stress. One of the bigger questions in the workforce is how to be a builder of teams Singapore whether or not that makes a difference on the bottom line. Whatever the reason, the fact remains that many adults feel stressed and burned out from their jobs. The worst part is, this doesn’t just affect you on the job. It’s a feeling that you take home with you and it can affect everything from your health to your finances. 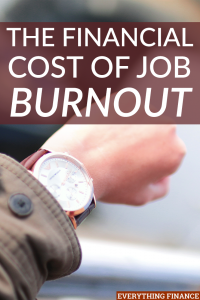 Consider these ways job burnout can cost you financially, they may end up making you rethink your current work situation. You can’t sustain a high-stress or over-working job environment for any prolonged period without it completely exhausting you. Your body and mind aren’t equipped to keep up with that pace or handle a stressful environment without it presenting itself elsewhere in your life. If you find yourself constantly exhausted at the end of each workday, it can be difficult to motivate yourself to do anything else. That being the case, it may cause you to spend money where you otherwise not have. You might feel too tired to put in the effort to cook, which means you could resort to take-out. Or maybe the thought of keeping up your home yourself seems like too much to bear, ergo you might begin to hire jobs out that under other circumstances you’d have done yourself. Whatever it may be, sheer exhaustion and job burnout is bound to cause you to spend extra money. As I said earlier, it’s impossible to keep up a pace that’s burning you out, which means that eventually your steam will run out. When that happens, job burnout is bound to affect your performance sooner or later. You might find yourself unable to complete projects or assignments to the best of your ability, which could cause you to lose clients or assignments and possibly lead to a demotion. If things get hard to handle it could even lead to a loss of your job altogether. If you don’t learn to say no every now and then or find ways to cope with your job burnout, it could cost you hundreds or even thousands through lost business or jobs, and give you the headache and added stress of searching for a new position. When things aren’t going well in one area of your life, like your career, it’s instinct to want to compensate in other areas of your life. Unfortunately, some of the ways we seek to cope can cost us money. For some, the instant gratification that comes along with shopping can provide instant joy. But it’s often short-lived. Plus, it’s a feeling we keep chasing again and again. No matter what you spend money on, whether it’s clothes, technology, or entertainment, it’ll cost you a hefty amount in the long run. Furthermore, it’s a bad habit that can be difficult to break and could leave you stacked up in credit card bills and debt before you know it, causing financial stress too. Stress and job burnout, especially when prolonged, can have some serious negative effects on your health, both mentally and physically. Psychological stress alone, could lead to panic attacks, anxiety, and depression. This may even lead you to seek out and need professional help. Even more so, however, stress can also have serious effects on your body as well. It may begin with smaller symptoms like fatigue and weight gain or loss. But over time, continual stress could lead to conditions such as ulcers, strokes, heart attacks and lessen the effectiveness of your immune system, especially if you suffer from other causes too. All of these health problems could rack up serious medical bills, since many of the stress-related conditions aren’t able to be quickly treated. On-going treatment will cause you to spend more money. Again, if job burnout affects your productivity, it will in the long term affect your job trajectory as well. If the quality of your work starts to become lackluster, it’ll become apparent to your superiors after too long, which could make them rethink you for a possible promotion or think twice before assigning you other projects as well. Moreover, if you reach the point where you actually lose your job, you’re forced to start back over at square one. So, instead of being able to put in your time and build yourself up at one corporation, you could end up spending weeks looking for a new position and starting all over. Thus, costing you possible income you could have made even sooner. It’s good to be eager and willing to take things on in any position. Nevertheless, however, there has to be balance in anything you do, which means you have to learn to say no to some things or you could find yourself worn out and burnt out quicker than you’d think. On the other hand, if your job is stressing or burning you out for reasons beyond your control, you might want to consider if it’s the right place for you before it takes its toll. Or you can try to find ways to prevent and cope with stress in your workplace. Whatever the reason is that you find yourself suffering from job burnout, it’s important to realize just how much it can affect you. Know that it can impact your physical wellbeing as well as your mental one and affect you financially as well, so you can work to monitor and manage your stress before it gets out of control. Have you experienced job burnout? What have you done to counteract it?